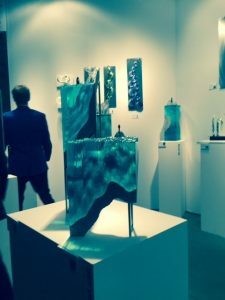 Art aficionados, collectors and anyone who has been to the annual SOFA art show know about the high quality works on display. Perhaps for everyone else the title, an acronym for Sculpture, Objects and functional Art and Design is misleading. SOFA isn’t a crafts fair. 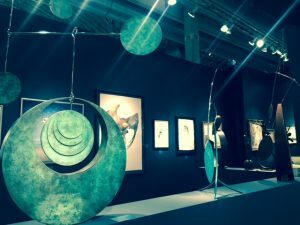 Nearly 70 galleries, some as far as Melbourne, Australia, Kyoto, Japan and London, England, have brought their showpieces to Chicago’s Navy Pier for the event. When asked during opening night why come so far, Melbourne’s Kirra Galleries Manager Suzanne Brett, said, “We come because this is the biggest collector’s fair in the year.” Her gallery specializes in exquisite glass objects. A couple of rows over are the gorgeous ceramics of the Sokyo Gallery from Kyoto. “This is the only one we do in the United States. It’s a good show for us,” said Yoshika Yajima. At the Thursday night preview reception, the crowd appeared to be collectors and buyers who talked about how pieces would fit with what they had. At London’s Gladwell & Patterson Gallery, Ella C. Elphick was adjusting a stunning mobile. “A lot of our customers are in Chicago,” she said explaining this was the gallery’s second year at the show. Interested in buying or not, SOFA is a good show to see what is trending and what might be fun to have. Begun Nov. 3, the show continues through Sunday, Nov. 6, 2016. SOFA is at Navy Pier, 600 E. Grand Ave., Chicago, IL. For tickets and other information visit SOFA and Navy Pier. 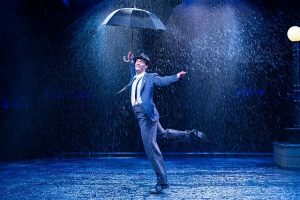 While the Cubs spectacularly reigned Wednesday at the Indians’ Progressive Field, audiences were treated to a spectacular ‘Dancing in the Rain’ production at Marriott Theatre Lincolnshire. Mobile phones checked Cleveland during intermission while MGM’s 1953 hit musical that starred Gene Kelly was brought back to life in Lincolnshire. “This is just a card,” magician extraordinaire /actor Brett Schneider tells the audience. 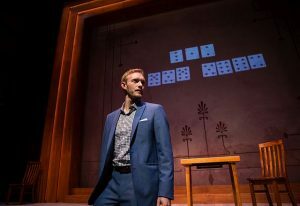 And so starts a little over two hours of Goodman Theatre’s fascinating The Magic Play. Smaller than the Albert Theatre, the Owen’s space is perfect for appreciating Schneider’s magic. But playwright Andrew Hinderaker has put a lot more up Schneider’s sleeve than astonishing tricks. Instead of subjecting oneself to all the election noise on TV and social media, try to feel good about the world, at least for a little while, by going to a fun event. An old fashioned musical opens this week. See what creative folks are doing with functional art. Visit an outdoor destination that has an unusual indoor exhibit this weekend. 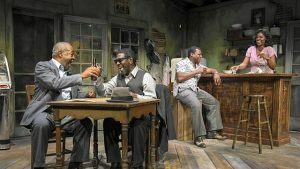 In East Texas Hot Links, Writers Theatre’s current show, the rhythmic speech of Adolph the “Professor,” the café setting, the discussions about work, life and death, and a sense of the economic futility of being black in a white man’s world, is somewhat reminiscent of playwright August Wilson’s Two Trains Running that ran at Goodman Theatre in 2015. 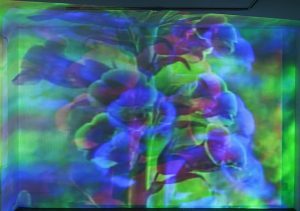 Be immersed in color, movement and animal life with “The Sympathetic Imagination,” a short retrospective of the work of video/film artist Diana Thater. Organized by the Los Angeles County Museum of Art, Thater’s installations take up the Museum of Contemporary Art Chicago’s fourth floor exhibition area now through Jan 8, 2017. It’s likely you have heard of German composer Wilhelm Richard Wagner and some of his operas such as Lohengrin, Tristan und Isolde, Die Meistersinger von Numrnburg and of course, the four-opera cycle of Der Ring des Nibelungen. 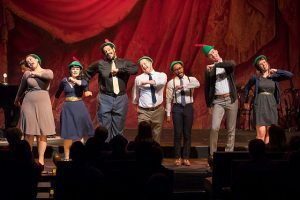 But if you want more insight into Wagner and the Ring as viewed through The Second City’s magnifying glass, try to snag a ticket to “Longer, Louder Wagner – The Second City Wagner Companion,” playing only this weekend in a Lyric Opera rehearsal room. 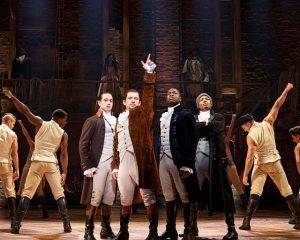 Listen up anyone who wants to see the Hamilton cast and any resident of Cook County who still needs to register to vote. The Chicago cast and Cook County Clerk David Orr will be at the Private Bank Theatre, 18 W. Monroe St., Chicago, midday today to encourage Cook County residents to register on line. 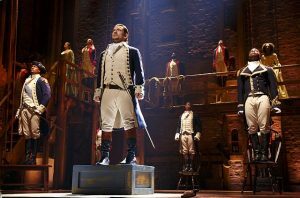 At “Hamilton’s” opening night in Chicago ( Oct. 19, 2016), its nearly three hours of rhythmic story-telling and exceptional choreography made it quite clear why lyricist, composer Lin-Manuel Miranda’s show about a Founding Father won several Tony Awards including Best Musical. Right, often overlooked, brilliant immigrant Alexander Hamilton was a Founding Father. So, there should also be an Educational Hook Award added to the list. It doesn’t matter if you look at the people on the street, on a bus, in stores or on TV, you are likely to see someone with a tattoo, today. 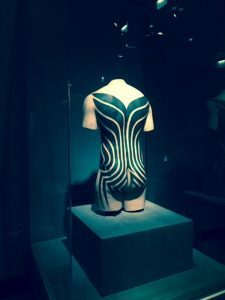 But if you want to know more about tattoos, see some rather spectacular ones and even get a tattoo or watch someone getting one, go over to The Field on Chicago’s Museum Campus.